Hello Loves. As promised in my previous post, here's my mani for the week. This one is a bit different than anything I've worn before for a few reasons. First, you'll notice my nails are much shorter. I'll explain why in a few. Second, I usually don't stamp with gold. I figured since I'm already out of my comfort zone with the length, I might as well push the limits. ;) Finally, these babies have a layer of acrylic under the gel polish (Please don't hate me! I promise, I'm not turning my back on my one true love. It was simply a good opportunity to practice what I'm learning. lol). If you read my last Nail School Chronicle update, you know I have been really hard on my hands the past few weeks and developed a few low splits. In an attempt to save my nails, I filed down my length and added an acrylic overlay. Sadly, my attempts failed. I ended up breaking my middle nail while buckling Bryant's car seat this morning. I swear, I hate that freaking car seat! So now that finger is sporting a sculpted acrylic nail. I'll show it to you at the end of the post. Let's talk about the gel polish and nail art that I'm wearing. The base color is Raspberry Rush from the Bundle Monster Fruit Cocktail Collection. The collection is made up of three new thermals including Raspberry Rush (I'll show you the others soon). Raspberry Rush is basically the cream version of Lady Incognito. In the warm phase, it is a soft, neutral pink cream. When cold, it shifts to a darker, more vibrant pink cream. I absolutely love this color combination! I'm also happy to report that Raspberry Rush is not as thick as it's glitter packed counterpart and applies nicely. It is also very shifty. I find that it is constantly changing, even with the shorter length and the warm snap we are experiencing. Wanna see her without the stamping? Please disregard the length difference. I swatched this one before I took down my length. I then stamped over Raspberry Rush with the snowflake full nail image from BM-H02 from the Bundle Monster Holiday Collection. The stamping polish is Maybeline Bold Gold. I honestly can't decide if I like this manicure more in the warm, transition or cold phase! Which do you like best? That's all for today. I promise I'll get the rest of the BMC Fruit Cocktail collection up for you soon. I also have one of the BMC Speed Gel collections and the BMC Red Carpet Collection (aka the Metallics) to show you too. 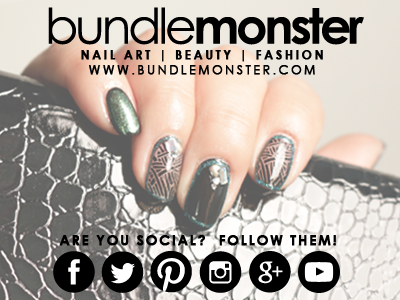 *The Gel Polish featured in this post was provided by Bundle Monster for my honest review. All other products were purchased by me. This post uses Amazon Affiliate Links. Purchases through these links generate commissions that help fund this site. All other links are courtesy links and do not generate commissions. I could see this wasn't quite your usual style, but it is SO pretty! I love how strong the thermal change is too! I love your mani warm and cold! I can't wait for you to show mulberry surprise, I have it and it's so much fun! ! My little girl is now begging for Lady Incognito with snowflakes. Hehe. Still praying for you, by the way. Loving the design. I think considering you've only been training for a short time your sculpted nail is brilliant. Better still, you know where you've gone wrong so fixing it next time you do one will be so much easier! What is the difference between Raspberry Rush and True Goddess? I love the transition phase to this manicure, it is so pretty!